Congratulations to Courtney Forsyth and Blair Anderson, who competed in the first round of the Donald Dewar debating competition, against Fernhill School. 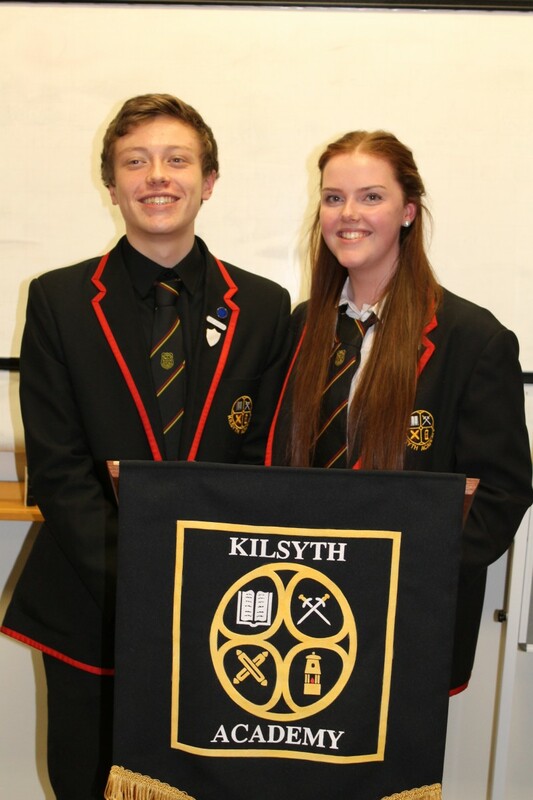 Kilsyth Academy hosted the event, which was very well attended. The Kilsyth team proposed the motion that ‘The internet does more harm than good’ and were successfully selected to proceed to the next round, together with St Andrew’s and St Bride’s High School, who also proposed the motion in the second debate of the evening. Thanks to Miss Graham for organising the event, supporting the team and chairing the debate. A big well done too, to Adam Boyd and Ross Chalmers, who participated in the Kirkintilloch Speakers’ Club annual competition for schools. Both boys spoke very well but were unplaced, on this occasion. Thanks to Mrs Burke for supporting the boys in preparing for the competition. Tickets are now on sale for our annual Christmas Concert, on the evening of Thursday 17th December. The price is £5 for adults and £3 for concessions, and can be purchased from the Music department. Collections for the Kilsyth Foodbank have now started and we urge everyone to give generously. In particular, the Foodbank would welcome donations of mince pies, Christmas crackers, chocolates, tuna/salmon, shortbread, fruit juice/Shloer, tinned ham, crackers and cheese. Our last day of collecting will be Friday 11th December. This is also an inter-House competition, led by Chanelle Gallagher 6A. The first of three S3 reports will be issued this week. This will be followed by a Parents’ Meeting on 12th January and further reports in March and June. 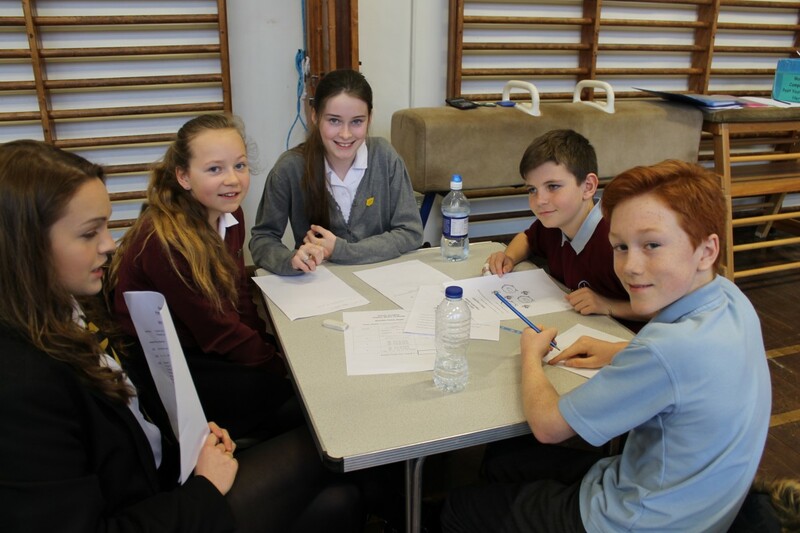 The annual Primary Maths challenge took place last week, for all primaries associated to Kilsyth Academy. The children had a great morning, solving puzzles and problems and taking part in the popular Maths relay race. The teams did very well indeed and Lennoxtown Primary were the overall winners. Many thanks to Miss Rae for organising the event and congratulations to Lennoxtown. Preparations for Crazy Day are well underway and we look forward to a great day of fun and fundraising, on Monday 21st December. The Pupil Council met last week and decided that the charities to benefit from this year’s Crazy Day would be Strathcarron Hospice, SAMH and Mary’s Meals – a local, national and international charity respectively. Congratulations to Mrs Stirling-Young who has been appointed to the post of Teacher of Biology, in the school. We are delighted that this post has now been made permanent. The Parent Council will meet on Thursday 3rd December, at 7.00 p.m., in the school. New members welcome. We were delighted to welcome so many parents and children from our six associated Primary schools, to last week’s Information Evening. 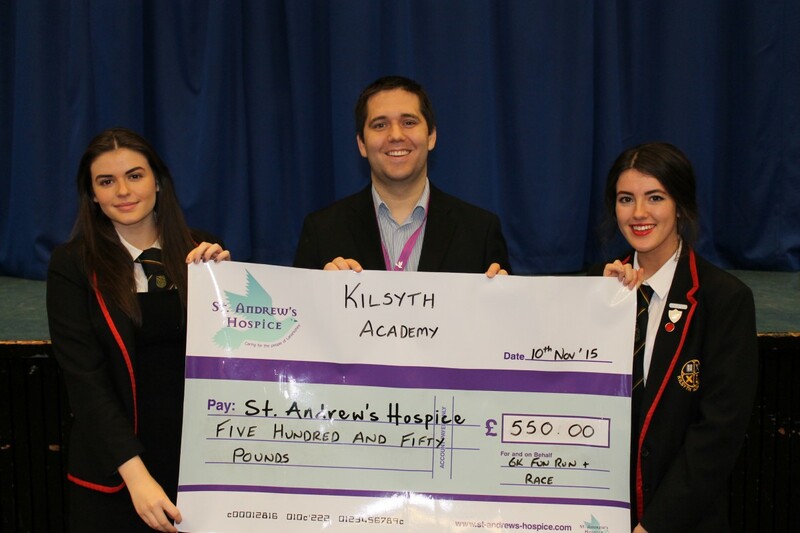 Despite the dreadful weather, almost 200 people attended and heard about the transition to Kilsyth academy from school staff and senior pupils. Most people also toured the school, visiting all the departments and finding out about the various subjects, from teachers and young people. Congratulations to members of 2D who ran a baking stall, for charities chosen by their class, and raised over £90. History and Modern Studies pupils took part in a trip to the cinema, to see the film ‘Suffragette’. The young people greatly enjoyed the experience, which contextualised some of the work they are doing in class. Higher English and Higher Drama pupils attended a production of ‘The Crucible’ at East Kilbride Arts Centre. Again, this will be of great assistance to their studies in class. Ben Cullen, Martin Murphy, Vicky Irvine and Emma Carrigan, all members of the S3 Achieve group, attended the Balmalloch Primary Tennis Coaching event, led by Judy Murray. The pupils have been helping at a number of sports events in our local primaries and were very pleased to be given this extra opportunity. We are hoping for a great turnout at our Information Evening for P6 and P7 parents, on Monday 9th November, at 7.00 p.m., in Kilsyth Academy. During the evening, there will be an opportunity to hear about various aspects of the transition process from Primary to Secondary school and our school captains look forward to sharing information about the wider life of the school. Thereafter, there will be an opportunity to tour the school and some staff and pupils will be available within departments, to showcase facilities and answer questions. Letters have been distributed via our associated Primary schools but the event is also open to any other families who are interested in attending. Last week we hosted two MSYPs, who explained to pupils about the work of the Scottish Youth Parliament. Thereafter, pupils each completed a questionnaire, as part of the SYP’s ‘Lead the Way’ consultation. 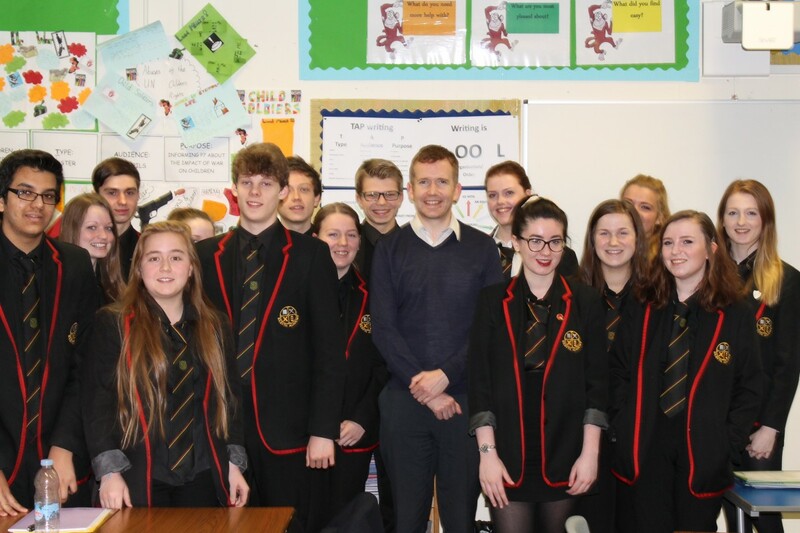 We were also pleased to welcome Stuart McDonald MP, who is also a former pupil of the school, to speak to the Higher Modern Studies class about his role. The discussion was extremely informative and the young people asked some excellent questions. Our annual Halloween celebrations were a great success, as always. Members of S6 organised three events, in total – a Ghost Walk and a party for S1 pupils and a Movie Night for S6. The young people who led these events, did so as part of their SQA Leadership Award and all those who participated had a great time. Well done to Lucy Rutherford, Rachel Kimmett and Chloe Laggan. Pupils studying National 5/Higher Art and Design and Higher Photography visited Kelvingrove Art Galleries and Museum last week, as part of their course. This included a visit to the ‘Century of Style’ exhibition, to support design folios, a visit to the galleries, to assist with expressive work and there were ample opportunities for Photography students to add to their folios. The pupils all found the day very beneficial. Thanks to Ms Andrew for organising the trip. Our Higher German pupils attended a German Immersion Day, at the Goethe Institute, in Glasgow. The pupils enjoyed the workshops and felt that the day was very valuable for their studies. Our S4 Employability classes attended the launch for the Youth and Philanthropy Initiative, which they will all be participating in, over the coming months. This will involve small groups of pupils investigating the needs of local charities and presenting reasons why their chosen charity best deserves a £3000 grant, to be gifted by the Wood Family Trust. We are delighted to welcome Mrs Lindsey Smith, another former pupil, as our new Library Resource Centre Manager. We are all looking forward to working with Lindsey and hope that she enjoys her new role. Congratulations to Mrs Jayne Gordon who has been appointed to the permanent post of Teacher of RME in Kilsyth Academy, following a 2½ year placement, which was on a temporary basis. We would also like to welcome Ms Lorraine Higgins to the English department, to cover the remainder of Ms Gough’s maternity leave. Rachel Kimmett (S6), Jack Rennie (S5), Harry Thomson (S2) and Sophie Bridges (S1) represented the school at the North Lanarkshire Pupil Council, held in Airdrie. The main items involved discussion about ‘Mentors in Violence Prevention’ and ‘Focus on Food’ initiatives.